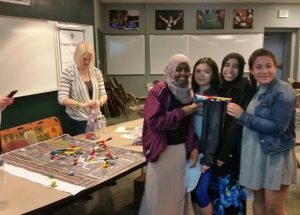 On March 16, we held a joint WTS TYOU/IGNITE event at Franklin High School hosted by the Port of Seattle. 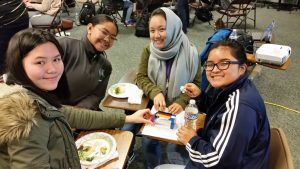 We had an impressive 52 students attend the event where we discussed the amazing air and sea projects happening at the Port, including the expansion of the north satellite terminal for Alaska Airlines, the upgrade of Terminal 5 for mega cargo container ships, and the expansion of the south satellite terminal for international arrivals. This last project was the impetus for our activity of the day. The Port plans to construct a sky bridge between Concourse A and the south satellite terminal which would allow passengers to move between the two buildings via a bridge that not only must allow airplanes to taxi underneath its span, but will be built off-site and then transported to and re-constructed at the airport. 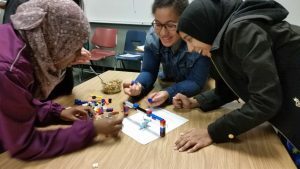 For the activity, we broke the girls into groups of 3 – 4 students and asked them to build a bridge out of Legos that could span the width of a piece of paper, while allowing a toy airplane to pass underneath the bridge. They also had to consider how the bridge, once built, could be broken up into the fewest pieces possible to pass through a toilet paper roll ‘tunnel’ and then reconstructed on-site. 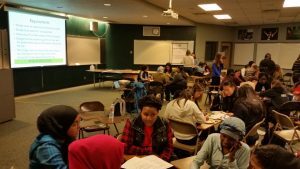 The activity spurred just the right amount of competition between the groups. It was fun and also got the girls thinking about the amazing logistical challenges faced on these impressive expansion projects at the Port. At the end of the event, (hopefully capitalizing on the enthusiasm generated by the activity!) 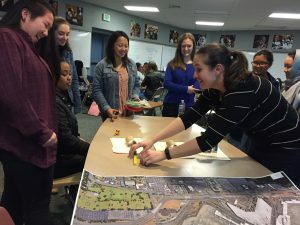 the Port presented the girls with opportunities for their summer internship program as well as part and full-time job opportunities available at the Port. Thanks again to the Port for sponsoring lunch and hosting the event. Joanna Hingle, Sara Mitchell, and Tanisha Delgardo were fantastic! Tanisha is actually a graduate of Franklin High School, so it was very cool to have an FHS alumni as one of the Port’s event leaders. Thanks also to Derek Bender for his pre-event coordination and Geri Poor for securing the lunch sponsorship. Thanks to our mentors Delanie Cornwell and Megan McIntyre as well for attending. It was so great to have help with set up, clean up, and encouragement for the girls during their activity. And thanks as always to our amazing FHS teacher liaison, Julie Gatti. Attached are some photos from the event. Enjoy!